67aR [“Aha!” … or a hint to 18-, 23-, 37-, 48- and 58-Across] I SEE, that old crossword staple. Phonetically, I-C and the initials of the referred entries. 18a. [What might make an adult jump in a pile of leaves] INNER CHILD. 23a. Home office item that’s surprisingly expensive to replace] INK CARTRIDGE. 37a. [What Ramadan is an annual feature of] ISLAMIC CALENDAR. Marquée entry. Is this the raison d’être for the theme? Where can we go from this? Initials! I’ve got 99 problems, but genuinely caring about the why of this theme isn’t one of them. 48a. [Obsolescent place to go online] INTERNET CAFÉ. 58a. [West African country whose name is usually rendered in French] IVORY COAST. Côte d’Ivoire, y’know. * But not immediately, so don’t get excited about my take on the Monday LAT. The last few WSJ puzzles have been politically themed. The day before the election, this puzzle is notably NOT politically themed. 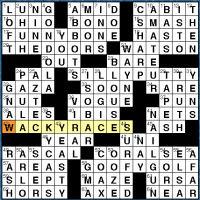 Today it’s just simple synonyms for “humorous.” Perhaps, editor Mike Shenk hopes to take our collective minds off this contentious election. I admit I solved the puzzle while watching TV so I really wasn’t paying close attention. But now I notice how beautifully clean it is. 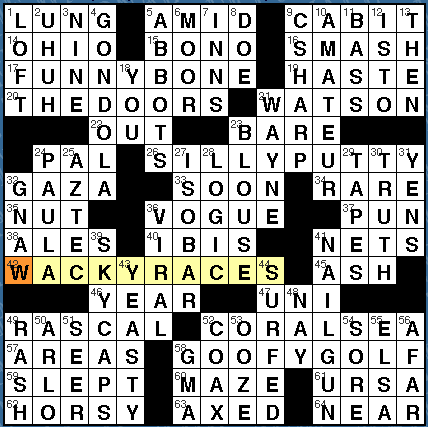 There aren’t any marquee long fill entries, but there are plenty of nice mid-range ones: GONDOLA, NAIL GUN, THE DOORS, CORAL SEA, AMATEUR, and SKYCAPS. This is what happens when you have only four shortish theme answers, plenty of breathing room, a few cheater squares, and a professional constructor/editor. There are two odd entries at the corners. CAB IT (9a, [Go by taxi, informally]) and HORSY (62a, [Devoted to equestrian activities]). CAB IT is not a phrase that I use, but I have heard it in a song from the original Muppet Movie. And HORSY doesn’t seem like a serious term that an equestrian would use (though maybe their toddler would). Also, Google seems to prefer the “horsey” spelling. That’s all for today. Best of luck tomorrow as you get out and vote. 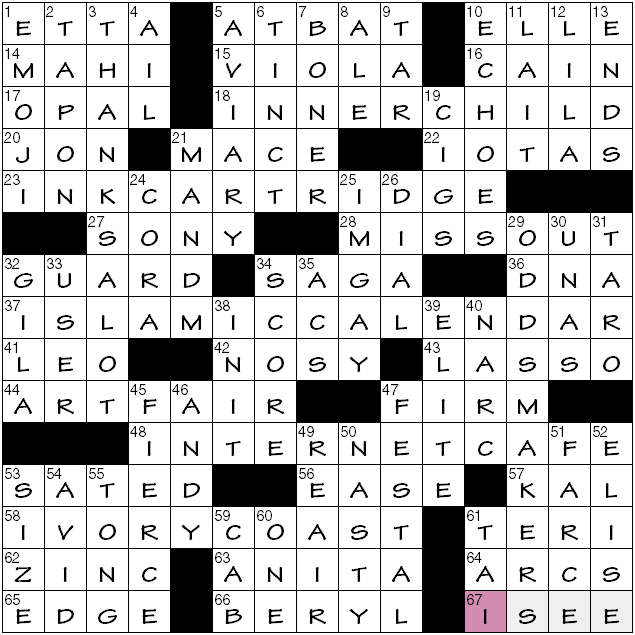 39aR [Not a close game, a headline for which may include the end of 17-, 30-, 46- or 63-Across] ONE-SIDED VICTORY. Möbius victorious! 17a. [High school infatuation] TEEN CRUSH. 30a. [A few hours for doing whatever] TIME TO KILL. 46a. [Rich coffee lightener] HEAVY CREAM. 63a. [One of two Senate “enforcers”] PARTY WHIP. Concluding the series by making the electoral analogy explicit? 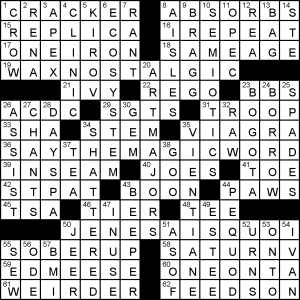 There are some things I could say about the puzzle—the typical mish-mash of connections between clues or entries, duplications, scientific binomials, questionable attempts at humor, editorial rebukes, and the like—but I beg your ongoing forgiveness while I continue to keep the postings minimal. Choice seeds – WAXNOSTALGIC, SAYTHEMAGICWORD, JENESAISQUOI – and some interesting letter patterns in the rest: SATURNV with a dextral mural IVAN and SEMIOTICS (crossing REGO, ulp!). This entry was posted in Daily Puzzles and tagged Brendan Emmett Quigley, Brock Wilson, Bruce Haight, Dan Fisher, Mike Shenk. Bookmark the permalink. Someone please explain how “Outstanding performance, so to speak” is CLINIC. I’m a big fan of BEQ but this seems outside the norm (even for him). When Tiger Woods won a big championship by 8 shots over the field you might say he was “giving a clinic” on how to play golf. Definition #6 of “clinic” at dictionary.com: “Sports Slang. a performance so thoroughly superior by a team or player as to be a virtual model or demonstration of excellence; rout or mismatch.” New to me, but I’m not sportsy. The .puz link for the WSJ isn’t working. Any idea when that will be available? Ditto LAT. I’m appreciative of the hard-working folks who post these for us. Don’t know. These are out of our control here at the Fiend. We’re reliant on the hosts of the puzzles putting them out there. 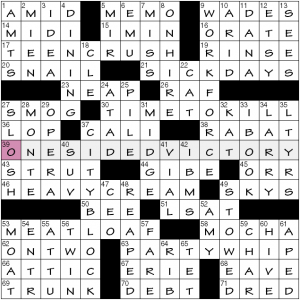 NYT: On XWord Info and Wordplay, Bruce Haight talks about the relationship of the theme “I see” to his job, ophthalmologist. Fun puzzle. Thanks for the kind words Lois!